THIS IS A SPOILER-FREE REVIEW. Thank you to NetGalley and Button Poetry for providing me with a copy of Depression & Other Magic Tricks in exchange for an honest review. All thoughts are my own and are in no way swayed by the gift. Depression & Other Magic Tricks is the debut book by Sabrina Benaim, one of the most-viewed performance poets of all time, whose poem “Explaining My Depression to My Mother” has become a cultural phenomenon with over 5,000,000 views. Depression & Other Magic Tricks explores themes of mental health, love, and family. It is a documentation of struggle and triumph, a celebration of daily life and of living. Benaim’s wit, empathy, and gift for language produce a work of endless wonder. 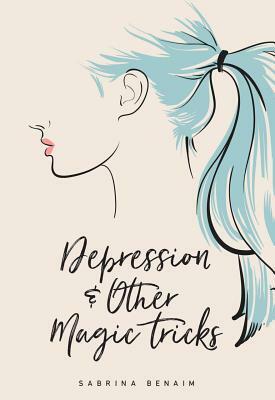 At-a-Glance Review: Depression & Other Magic Tricks is a good-sometimes-great collection of poetry about love and mental health, and the ways in which they intersect. My biggest issue was with choppiness in some of the poems, but that style might be what other readers of poetry prefer. Guys, I’ve been excited to read this book for months. Like many other readers and reviewers, I discovered Sabrina Benaim’s poetry via the internet (Facebook, specifically) and her performance poetry videos. “explaining my depression to my mother (a conversation)” blew my mind and stuck with me; I re-watched/re-listened multiple times and showed it to everyone I know (except my own mother). When I read this poem out loud myself, directly from the book, to my husband while laying in our bed in the dark… I read it how Benaim performed (ish; I’m not a performer myself). Anyway, I joined NetGalley a couple of weeks ago (if you like reading, get on it), and saw this book was available. I requested it, crossed all of my fingers and toes, and did a happy dance when I found out I’d be given a copy. I dove in that night, read a handful, re-read them, and then put it down to sleep on them. My feelings about this collection: warmth, aching, understanding, resonance, gratitude; there were a few moments of confusion and slight disappointment. By the rating at the top of this review, though, you know I liked this book. I liked Benaim’s voice throughout, the way her long lines and prose poems suggested artful streams of consciousness. I liked the lowercase aesthetic (in fact, I love all-lowercase aesthetic); I also liked that proper nouns were capitalized, and that a few of those proper nouns were “Beyoncé”. Though the format changes poem to poem, Benaim’s voice and parts of her style are strong. My favorites were the prose poems and the poems with long lines with fewer breaks. Benaim is a fabulous prose poet, in my opinion. She writes gorgeous lines, creates wonderful metaphors and imagery, and blocks work well for her as she uses more full sentences than phrases — even in her poems without punctuation. Her writing style is narrative, and it works for her. The mostly-lowercase, mostly-complete sentences are what make her voice hers. To remove the extra pronouns to better fit broken lines would take away from her style and voice. Her poems made up of short line lengths were choppy and, really, the weakest of her poems because of that choppiness. They seemed to be filler poems to add length to the collection. That is to say, they were fine, but they weren’t great. The block poems were good but ruined by the excessive number of slashes; they suffered the same choppiness as the poems with excessive line breaks. Overall, Depression & Other Magic Tricks is a good-sometimes-great collection of poetry about love and mental health, and the ways in which they intersect. There were a few poems that I personally would have cut, but they did not ultimately detract from the reading experience in a glaring way. My biggest issue was with choppiness in some of the poems, but that style might be what other readers of poetry prefer. I do recommend this book to anyone who likes contemporary poetry. I’ll be re-reading many of these poems again and again, as I got something new out of them each instance I re-read them for this review. Have you seen/heard Sabrina Benaim read/perform? (If not, here is what introduced me to her work.) Have you read Depression & Other Magic Tricks? How do you feel about the different formats? What is your favorite book of poetry? I’m not usually a lover of poetry but don’t mind the contemporary kind and do recall the piece that made her famous. The performance aspect makes it extremely powerful. I might go check more if her out after reading this review. Thanks! Hiya, I’m Kaiya! I’m 25, a young professional in the advertising world, and I’m trying to do something with my English degree. I blog about my life and the bits in between: books, products, mental health, and travel. thank you @kayaninewyork for my gorgeous locket! it’s stunning and i can’t stop looking at it. || ft. rose gold, turquoise stones, and a compass.